If you’ve ever had to scramble to get to work because your car isn’t running — or you've been unable to drive due to an injury — you understand some of the challenges of the vast number of Americans who rely on public transportation in small towns. And as baby boomers move into their golden years, they’re creating demand for more investment in public transportation options — especially in small towns and rural areas. Those are the findings of a study by the American Public Transportation Association (APTA) showing such small-town ridership grew nearly 8 percent from 2007 to 2015, even though rural populations declined by more than a half million residents. The top users of such rural amenities? Seniors, veterans and those with disabilities. In many cases that population would otherwise find it problematic to find regular transportation to and from jobs, healthcare facilities and stores, explaining why it’s important to convince legislators to invest in creating more small-town infrastructure and programming. Specifically, proponents hope Congress steps up by fully funding public transportation through the $61.1 billion FAST Act first approved in 2015. The range of amenities could include everything from buses to light rail, or paratransit, a category that encompasses supplemental services such as specially equipped vans. "It's no secret we are a major retirement area for millions of seniors moving from other areas including many, many veterans," states Brad Miller, CEO of the Pinellas Suncoast Transit Authority in St. Petersburg, Florida. "Public transportation is so critical as we all are aging and need mobility options as we get older." * A full 33 percent of U.S. veterans who are part of the VA health care system — some 2.9 million people who have worked to defend our country — live in rural and small towns. Many have been wounded and rely on public transportation due to limited mobility. * Americans with disabilities who live in small towns require 50 percent more public transportation trips than unimpaired people. * Because many seniors prefer to age in place rather than move to high-employment urban areas, seniors make up 17 percent of populations in rural areas compared to 13 percent of urban populations. * Transportation can take a big financial bite out of those living in rural areas; on average, they spend 7 percent more on transportation than city dwellers. For example, driving an older-model car costs about $3,000 annually — an average $20 per trip — while public transportation in rural areas averages out at $7 for every five miles traveled. * Rural public transit boosts safety and reduces the overall risk of traffic accidents, and not just among vulnerable populations. U.S. commuters as a whole reduce their crash risk by more than 90 percent when choosing public transit over driving; overall, transit-oriented communities undergo just 20 percent of the traffic casualties suffered by auto-oriented communities. To help address transportation issues for seniors, the San Joaquin Regional Transit District in San Joaquin, California, is offering a transportation service allowing them to meet non-emergency medical appointments. "We need to connect seniors to jobs, and especially to their medical transportation services," emphasizes CEO Donna DeMartino. "They may have healthcare, but if they can't get there it does them no good." 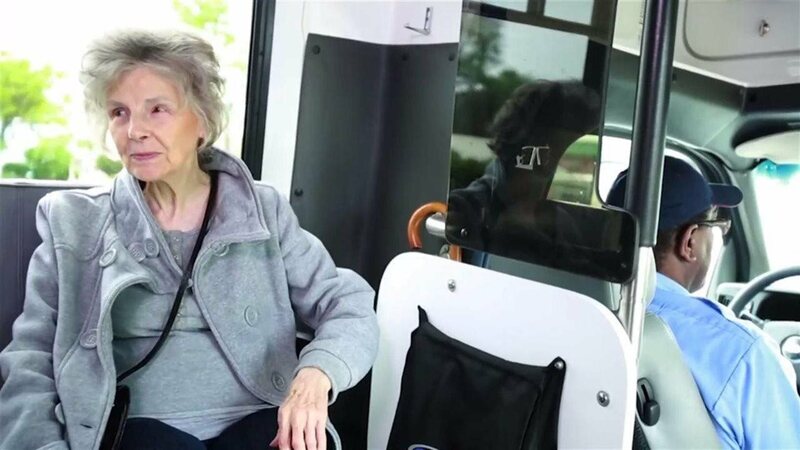 Transportation is also key to older residents of State College, Pennsylvania, one of the fastest-growing retirement communities in the nation. "We do have a number of people who have stayed in the area or are coming back home, and they want independence and to stay in their homes," notes Louwana Oliva, general manager of the city's Centre Area Transportation Authority. "A lot of times, transportation is that key. They can manage to stay at home if they have transportation that gets them to healthcare and out to socialize." Americans need to move forward to keep our country productive by encouraging legislators to look out for the needs of our vulnerable populations in small towns. Learn more about the FAST Act and supporting public transportation in rural areas at www.apta.com/rural.